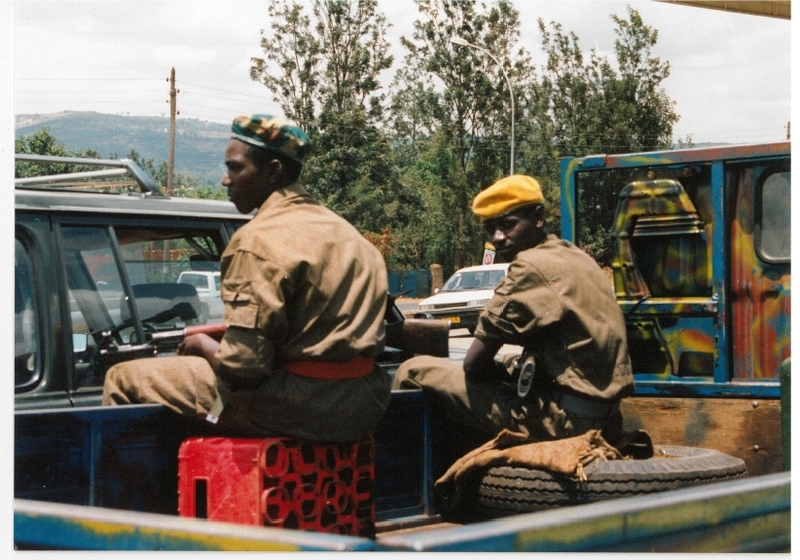 Rwandan Patriotic Front (RPF) soldiers in Rwanda, circa September 1994. Photo from personal collection of Prudence Bushnell. By Linda Melvern, Gregory Stanton, et al. Washington, DC, May 21, 2014 – The Arusha Accords, a peace agreement between the Rwandan government and the Rwandan Patriotic Front (RPF) signed in August 1993, failed in the worst way peace accords can fail — genocide. Documents posted today by the National Security Archive and the Simon-Skjodt Center for the Prevention of Genocide at the United States Holocaust Memorial Museum chronicle the international community's role in the failure to implement the demobilization program, a key part of the Arusha Accords, ultimately leading to genocide in April 1994. Today's posting is the 7th in a series of a joint "#Rwanda20yrs" project, a partnership project between the Archive and the Museum to mark the 20th anniversary of the genocide in Rwanda. The documents posted today were obtained through Freedom of Information Act (FOIA) requests, the State Department Electronic Reading Room, and from International Criminal Tribunal for Rwanda (ICTR) evidence. Future briefing books will examine international diplomacy, intelligence reporting, and the fateful decision to withdraw the bulk of the United Nations peacekeeping force. The Arusha Accords were a UN-sponsored agreement between the RPF, a predominantly Tutsi rebel group, and the Government of Rwanda. This posting will look specifically at the military power-sharing (demobilization and reintegration) section of the Arusha Accords which was a small but crucial part of the larger political context in which the genocide occurred. These documents shed light on the failure of the international community to fully support Rwanda's efforts for peace, as well as the Rwandan government and the RPF's failure to implement peace. Map of Tanzania, edited by Emily Willard. Excerpt from Leader's report, "Internal Insecurity," see Document 4. Complicating the Arusha negotiations were the various splits among the political parties within the Rwandan government delegation. This is evident in various reports from US observers (Document 8) and the Rwandan delegation's reports sent back to President Habyarimana in Kigali (Document 14). 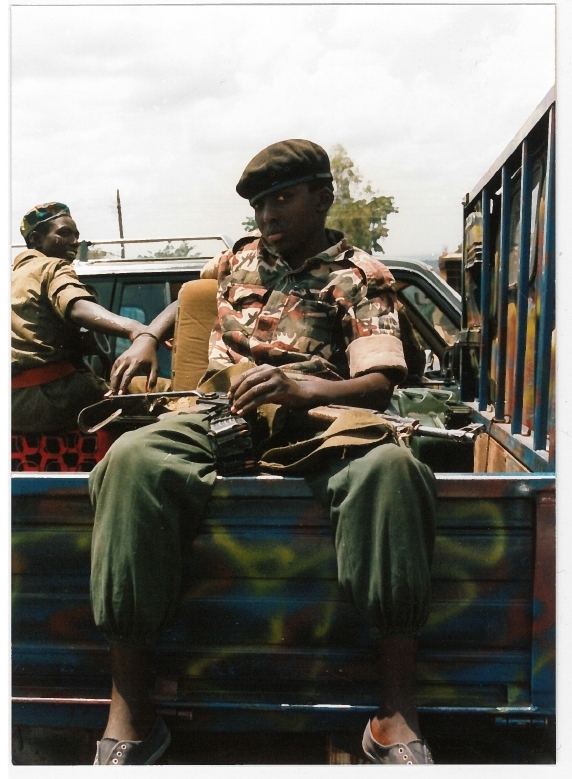 Major disagreements were: how the militaries would be integrated, the size of the overall force, and what proportions of RPF and former government forces would make up the new Rwandan Armed Forces (Document 9). The RPF and Rwandan government also disagreed about how to choose which soldiers and officers would be demobilized, how to successfully integrate them back into society, and security concerns about the demobilization process (Document 7). "Between the time of the signing of the agreement, and the beginning of the genocide…a considerable amount of attention was being given to this whole issue about demobilization, and reintegration of the soldiers… this whole issue of reintegrating people in a society that doesn't have a lot of development going on, that isn't growing…most of the jobs are in the public sector, rather than in the private sector, and it was very hard and some very smart people were working on this. How do you go about this, how do you do this?" National Security Archive, oral history interview with DCM Joyce Leader, October 29, 2013 in Washington, D.C.
As a part of the Arusha negotiations, the international community was asked to provide a "neutral international force" to assist in the implementation of the peace accords. Most notably this included helping to facilitate the disarmament, demobilization, and reintegration program, and to help secure funding for the program (Document 10 and Document 39). However, the international community struggled to come up with the funds, the Rwandans never installed the transitional government, and the demobilization program was never implemented (Document 23). The documents show that implementation of the Arusha Accords proved challenging for many reasons: distrust among the signatories, lack of funding for programs, security concerns related to the process of demobilization, challenges in integrating the militaries, and increasing political tensions. Weeks after the Arusha Accords were signed in August of 1993, (Document 32), Joyce Leader writes back to the US Secretary of State warning that "although leaders of both sides have signed the peace accord, neither side trusts the intentions of the other" (Document 18). In late November 1993, the peace agreement and cease-fire were on very delicate footing when a massacre in the prefecture of Ruhengeri put the RPF and government at odds, both refusing to participate in the joint commission that had been set up to integrate the militaries, and thus further stalling demobilization efforts (Document 19 and Document 20). There was a lot of officers, a lot of NCOs [non-commissioned officers] and a lot of troops, who for the previous three years during the war, had had a steady salary, they had food for them and their families, they had a job, and — and now suddenly they were going to lose their livelihood. There was no secret about us not having the money for the DDR [disarmament, demobilization and reintegration]. So they're sitting there going, and what am I going to do? In that society, where there's no social safety net, when you fall, you fall far… I think that was a major…destabilizing factor in the military, especially on the government side, those troops were worried about their futures. National Security Archive, oral history interview with Maj. Brent Beardsley, April 30, 2013 in Washington, D.C.
By January 1994, UNAMIR and the US Embassy were reporting that in fact the opposite of demobilization was happening: political parties increased training of armed militias, and were distributing weapons to civilians (Document 25). The international community failed to raise funds to support the demobilization program, and the Rwandans failed to install the broad-based transitional government week after week, leading to rising tensions among soldiers as their future became increasingly uncertain. …we had to go out with hat in hand saying, who's going to pay for these pensions? Well, the IMF [International Monetary Fund] said, we don't do that. The World Bank said, we don't do that. The U.N. says, we don't do that. So we said well, we better start figuring out who's going to do it, because when we get all these soldiers into demobilization camps, and they've been promised this, and they know it, and they don't get it, there's going to be trouble. The problem was complex and multi-fold: the international community would not provide humanitarian and development aid (including for the demobilization program) until the Rwandans installed their transitional government as agreed upon in the Arusha Accords. However, due to massive uncertainty and instability within Rwandan politics, and increasing tensions about demobilization, the transition government was never installed. Documents show that the US was hesitant to commit any funding until it was clear what other countries were committing: "there [was] a general feeling that the Europeans and others should be doing more" (Document 23). "Turf battles" cropped up between the United Nations Development Programme (UNDP) and the World Bank over funding of the demobilization program, causing the organizations to "work at cross purposes" (Document 37). The international donor "roundtable" that was supposed to raise funds for Rwanda was delayed due to Rwanda's failure to install the transition government (Document 40 and Document 41). Excerpt of Tarnoff's message to Amb. Rawson about why the US is stalling on providing funding for Rwanda's demobilization program, see Document 23. Throughout March 1994, the Rwandans failed to resolve the political impasse. The unresolved political tensions eventually reached a boiling point in April 1994, after President Habyarimana's plane was shot down. The next morning. April 7, 1994, the genocide began during which between 800,000 and one million Rwandans, predominantly Tutsi, were slaughtered. While this collection of documents begins to help us better understand the failure of negotiated settlements in Rwanda, key records are still unavailable to the public. Access to Rwandan, French, and Belgian government documents, as well as key US government documents from the Clinton Administration would provide a clearer picture of state-level and individual motivations in the decision-making process, who the perceived winners and losers were in the negotiations, and how this affected the outcome. 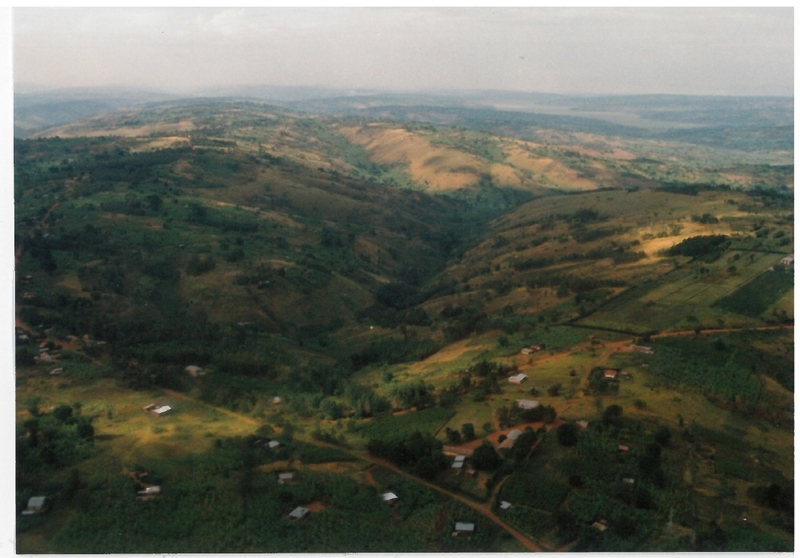 Rwanda: "Land of 1000 Hills," circa September 1994. Photo from personal collection of Prudence Bushnell. This document provides details about the complexities of the demobilization and integration of the government and RPF forces. Both parties in the negotiations, as well as observers, knew from the beginning that integration of the armies would be challenging. In May 1992, the US Ambassador to Rwanda at the time, Robert Flaten, writes back to Washington about the beginning conversations and strategies for peace negotiations between the Rwandan government and the RPF. The RPF requests that the US be present at the negotiations "because of doubts over the neutrality of the French." The US agreed to be involved only if all parties, including the French, were "ready for the US to participate." Flaten writes that "President Habyarimana believes that integration of the army will be the most difficult aspect of the RPF's demands." "Rwanda's new Minister of Defense, James Gasana, noted several difficulties to reintegration of the armies: Many RPF fighters have served in the army of another country [meaning Uganda], raising the question of loyalty; variations exist in the level and quality of training of the two forces; [US Assistant Secretary of State for African Affairs Herman] Cohen's suggestion risked leaving minority Tutsi overrepresented in the army." Ambassador Flaten writes that any mention of demobilization causes a surge in violence on the streets of Rwanda. He reports an outbreak of violence in Ruhengeri, a city to the northeast of Kigali, due to "inadequate reporting [on] the Kinyarwanda radio of the government plans for demobilization of the army." The French-language station reported that the "government was considering plans for retraining demobilized soldiers when the war was over," but on the Kinyarwanda station "it simply came out that the army was to be demobilized." Lt. Col. Nsengiyumva Anatole, a Rwandan intelligence officer writes a memo to the Army Chief of Staff for the Rwandan Ministry of Defense about his personal opinions on rising tensions and opposition to the Arusha negotiations. He says that, "in a nutshell, many people severely criticize the contents of the Accords which only favor the RPF to the detriment of Rwanda…most people who criticize the Accords are worried about the possible merger between the Rwandan Armed Forces [government troops] and RPF elements. The civilian population is opposed to this eventuality and believes that it is a devious way of seizing power in Rwanda from within." He also writes that "even members of some opposition political parties, especially the [Democratic Republican Movement] MDR, are not in favor of any merger between the Rwandan Armed Forces and RPF armed elements. In fact, all those who are against the merger believe that our country is being sold to the enemy." In this cable, Deputy Chief of Mission Joyce Leader clearly makes the connection between rising violence and internal insecurity in Rwanda and the on-going political discussions in Arusha. Leader reports that the "party youth, the Interahamwe of the president's MRND [Revolutionary Movement for National Development] party and the hard-line CDR [Coalition for the Defense of the Republic] youth, appear to have been the principal architects of recent roadblocks and attacks, while the main opposition party, the MDR, probably provoked most of the recent commune-level violence in the south." She notes that the judicial system has failed to hold accountable the perpetrators of the recent violence. She reports that "many Rwandans are convinced that the internal insecurity rampant in the country in the last six months is no accident, but they disagree on the source. Both sides in Rwanda's political dialogue believe the incidents of internal insecurity fit with the plans the other has to destabilize the country in order to achieve its goals." In a foreshadowing conclusion, Leader writes that "the use of violence by either side in this political debate…threatens the very fabric of the society by stirring hatreds that will be difficult, if not impossible, to calm." " In 1992… July, the government and the RPF agreed to meet in Arusha, and they immediately…agreed to a ceasefire and to an agenda for peace talks…but at the same time, there was an increase in interparty violence that was happening… I also look at it as a perversion of political parties, because it was where parties [political groups] were being used as vehicles of violence, rather than as vehicles for getting out messages of the political parties." Rwanda's Defense Minister, James Gasana, travels with a delegation to meet with Department of State and Department of Defense officials in Washington, DC about planning to integrate Rwandan government and RPF forces, part of the Arusha negotiations. US officials report that "the delegation expressed fears that the process of integrating the RP[F] into the security forces would lead to destabilization. In their view, a 'disproportionately' high percentage of RP[F] soldiers would upset the ethnic balance and lead to security problems. Similarly they fear that simultaneous integration and demobilization would destabilize further the economy by sending large numbers of soldiers into unemployment." The delegation and US officials then discuss possible solutions, and look to demobilization plans in other countries as a model. The Rwandans find Nicaragua's demobilization model irrelevant to their problems, claiming Nicaragua's police forces are integrated across ideological lines rather than an army integrated across ethnic lines; Zimbabwe's demobilization model is more promising. RPF and Rwandan government representatives reconvened in Arusha, Tanzania, to hold negotiations which were to develop into the "Arusha Accords." US observers (among observers from other five other countries) in Arusha report back to the Secretary of State on a possible delay in the negotiations due to disagreements about force proportions for integration of the two groups' militaries. The report writes: "There was some concern that any delay would increase the restlessness of the troops in the field, endangering the cease-fire." The report also gives an update of the status of what was being negotiated: "...on the integration of forces, Uganda would urge the RPF to accept a proportional formula substantially less than 50-50; 30 percent would be adequate and a better expression of their actual numbers." US military advisor for the State Department, Colonel Toney Marley provides advice to the negotiations. The cable reports that "Col. Marley has already provided to the OAU [Organization of African Unity] information on military integration in the settlements in Nicaragua, El Salvador, Angola, and Namibia; we think it might be appropriate to add Zimbabwe to that stack as well." " The military discussions were looking at a couple of issues…one was the restructuring of the army itself. How would…the RPF be integrated into the army, in what proportion? In what proportion at the leadership levels, in what proportion at the unit levels? And so this was a very big discussion, in and of itself." This document reports an update on the negotiations at Arusha including the integration and demobilization of the armies, discusses force proportions, possible processes of integration, and estimated numbers of troops to be demobilized. Ambassador Flaten writes: "the Rwandans are ready with a firm proposal for integration, and have done some good thinking on subsequent demobilization. The tough problem will be securing an agreement on the proportion of RPF to be integrated into the Rwandan army." Demobilization entails the massive scaling down of forces from 40,000 to possibly 10,000, and the planning of how to reintegrate the demobilized soldiers. The document discusses the logistics of building secondary schools and providing security for demobilized soldiers born in Rwanda. From: Colonel BEMS Bagosora, et al. This document, written by several Rwandan military officers, including Colonel Théoneste Bagosora (later convicted of genocide), reads: "the atmosphere of the negotiations was one of dealings and differences of opinion among the government delegation, a logical consequence of the political situation that reigned in the country." The document also details the impasse during the political part of the negotiations, specifically because of disagreement about whether or not to let CDR (Coalition for the Defense of the Republic) political party into the transition government, and also clarifies RPF alliances with other parties. Those involved decided to take a break from the political discussions, and move to discuss the military power-sharing and integration. This document contains a report back from US military and political advisor at the Arusha negotiations Lieutenant Colonel Tony Marley about an impasse in the discussions on negotiating the size of the new Rwandan armed forces. He writes that the Rwandan government wants 25,000 total (17,000 army and 8,000 Gendarmeries), and the Rwandan Patriotic Front (RPF) wants no more than 15,000 total, but are flexible with how many Army troops, and how many Gendarmes. Facilitators and observers generally agree that 25,000 is an excessive total number. "The GOR [Rwandan government] believes it will face increased insecurity problems stemming from demobilization, the return of exiles to Rwanda, and the evolution of multiparty politics and ethnic tensions. This would require a gendarmerie or police-type force of one policeman per 1,000 citizens, which following the return of some 500,000 exiles, would mean 8,000 gendarmes…the transitional government could also demobilize the integrated armed forces below the level of 25,000 if the circumstances require." 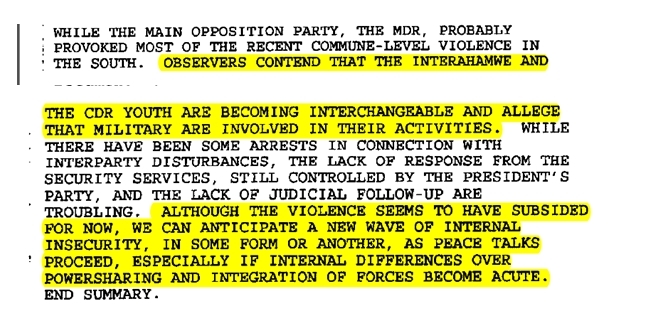 US observers to the Arusha negotiations report that the RPF wants the Gendarmes to be part of the demobilization/integration process, but the Rwandan government does not. A neutral international force used to monitor integration would play a key role in the demobilization and integration process. While the details of a demobilization plan are unclear, it would likely involve educational opportunities for demobilized soldiers. This document details plans for a citizen security apparatus under a new government and two key points of disagreement about demobilization. The Rwandan government wants soldiers identified for demobilization to be separated from rest of the troops, then "released to a demobilization activity." The RPF wants all troops to stay together until demobilization. Additionally, the RPF wants remuneration provided to the families of deceased soldiers, but the Rwandan government rejects this because "it has no comparable system and could never verify RPF claims." This report from a US observer, DCM Joyce Leader, contains ideas about how to have the armies meet as a part of the initial integration phase. Portions of documents from the peace talks enclosed in this cable provide a clear view of the initial challenges and practical complications involved, including establishing a basic level of trust before beginning to integrating the armed forces. A copy of a text from the Arusha negotiations, contained in the cable from Leader and titled "Proposed Confidence Building Measures (CBM) for Rwanda," states the following as some of the first problems that need to be addressed: "There remains a high level of mistrust between the two sides, whose senior officers have not yet had a formal contact despite the fact that their representatives have been talking to each other for close to 10 months." The same document also provides ideas of how to set up an initial meeting between the two armed forces: "The government and RPF forces could engage in a process of asking questions about each other's activities, force level, intentions, trainings, weaponry, perception of the future, etc. There would be no obligation on either side to answer any question, but any answers given would have to be complete and truthful. As communication improves, issues of increasing sensitivity could be broached." Also, "Rank and file members from both armies could engage in joint cultural and sporting events." Colonel Théoneste Bagosora, and other members of the "strategy committee," write to the Rwandan Minister of Foreign Affairs, who also serves as the head of the Rwandan government's delegation to the Arusha negotiations, to express their opinions on the issue of proportions within the National Army. Bagosora expresses his displeasure with the delegation's negotiations. This document shows a clear disconnect between Kigali and the government delegation at Arusha about strategy and negotiating, and among the members of the government delegation itself. In a cable to the Secretary of State, Ambassador Flaten writes, "...post does not know if there is a critical mass in the military supportive of the transition to democracy. Should peace come, integration and demobilization will be the critical factors in determining whether democracy will survive in Rwanda." United States representative to the United Nations Madeline Albright writes to the Secretary of State about the possibility of sending a peacekeeping force to Rwanda to support the implementation of the Arusha Accords that the parties are expected to sign soon, and to "create the atmosphere of stability." She reports that a neutral international force should be a "classical peacekeeping operation" since "the peacemaking has already (almost) been accomplished by the Tanzanians" with the signing of the Arusha Accords. She writes that it is a "moral obligation for the UN to help bring peaceful solutions to conflicts when asked. This is one case where both parties actually seem to be displaying the will to lay down their arms and move towards peaceful settlement as opposed to other areas (e.g. Angola, Bosnia, Georgia) where the goodwill of the protagonists is questionable…Turning away from this call for help could have tragic human consequences." In a cable to the US Secretary of State, US Ambassador to Rwanda, Robert Flaten provides details about the demobilization plan, and reports that the Rwandan government requires financial assistance for 6 areas of demobilization planning: "1. organization of cantonment sites [military quarters], 2. repossession of arms illegally in the possession of civilians, 3. demining operations, 4. payment of demobilization bonuses, 5. training and education of demobilized soldiers, 6. provision of employment for soldiers needing no further education/training." Members of the National Army "shall not be affiliated to political parties nor any other association of a political nature." They also "shall not take part in activities or demonstrations of political parties or associations." The total size of the National Army is to be 13,000 people. Article 18 states that "The Broad-Based Transitional Government [BBTG] shall take all necessary measures to ensure the integration of the armed forces from the two parties." But since the BBTG was never installed, the intended integration process never took place. Regarding force proportions, the National Army and the National Gendarmerie, "the Government forces shall contribute 60% and the RPF 40% of the forces" except for specific officer positions that were to be 50% (see Articles 74 and 144). DCM Joyce Leader writes a long report back to the Secretary of State about the Rwandan peace process in the weeks following the signing of the accords. She writes that "the peace accord provides a blueprint for a complex, tightly scheduled 22-month transition period intended to end in multi-party elections...Goodwill on all sides should enable Rwandans to succeed in the difficult task of making the peace plan work. Nevertheless, they will need sustained bilateral and multi-lateral assistance from the international community." She also questions the commitment on all sides to implementing the peace accords. She notes general mistrust of intentions of the other sides, which could cause problems for integrating the armed forces. She writes: "Although leaders of both sides have signed the peace accord, neither side trusts the intentions of the other. Historic rivalries between the majorities Hutu, who predominate inside the country, and the minority Tutsi, who predominate within the RPF, continue to fuel antagonism. On the one hand, doubts persist about whether the RPF is committed to democracy or to a takeover of the government and the restoration of Tutsi rule. On the other hand, doubts also persist about the commitment of the president and his close entourage to sharing governance of the country with the RPF. Mental and emotional adjustments won't be easy. " There are those who contend that Rwanda should never have been trying to have a peace process and a democratization process at the same time, because the one allowed the other to gain control of the situation. The "neutral international force" was deployed to Rwanda as the United Nations Mission for Rwanda (UNAMIR) in late October 1993 to help implement the Arusha Accords signed in August 1993. The UNAMIR force commander, General Roméo Dallaire, writes in a weekly situation report that the Rwandan government is "crying wolf" about possible attacks by RPF and Uganda troops, and also reports on a massacre in the prefecture of Ruhengeri, saying that both of these incidents are having an effect on the implementation of the Arusha Accords. He writes that the Rwandan government "stated that they were breaking off their participation in the joint commission for the reconstitution of the forces and gendarmerie [sic] as per the Arusha peace agreement because of this massacre. The talks had been off since mid-October but head of mission has been influencing the Minister of Defense to come back to the table over the last week in order to avoid any delays in the demobilization calendar. Head of mission has demanded from the Minister of Defense the proof he has of the RPF participation in the massacre." The sitrep also discusses other demobilization and integration issues in the "RGF Sector" section of the report. The report also lists figures, funding needs and potential problems implementing the plan. This document details the new US Ambassador to Rwanda David Rawson's meeting with the World Bank to discuss ideas and plans for demobilization in Rwanda, and potential funding issues and solutions. Peter Tarnoff, Undersecretary of State for Political Affairs, reported that "while the [Rwandan] government is receptive to the IMF [International Monetary Fund] and World Bank suggestions, the Bank staff noted that it is facing many constraints, and has pivotal decisions to make soon." He goes on to write that, "the Bank also supports having a UNDP-led [United Nations Development Programme] roundtable on Rwanda to assess humanitarian (including demobilization) needs, but only after there is a comprehensive macroeconomic agreement and funding is found to support it." The cable concludes that "the Bank appears to have a strong desire to create a program that meets Rwanda's needs." In a weekly situation report from the UN's special representative, Jacques-Rogers Booh-Booh (General Dallaire's civilian supervisor) reports that UNAMIR has successfully escorted the RPF battalion and VIPs from Mulindi to Kigali City. 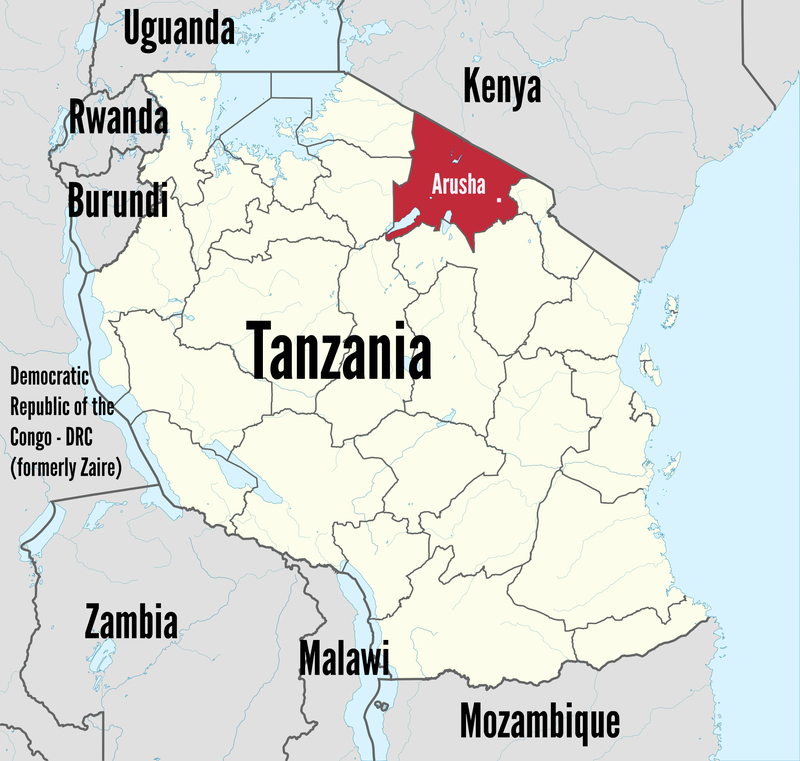 This is one of the first milestones for the implementation of the Arusha Accords, working towards the installation of the Broad Based Transitional Government (BBTG). Booh-Booh writes that "UNAMIR fulfilled timely the main military requirement for the establishment of the BBTG." A short cable from the State Department back to the US embassy in Kigali reports the disapproval of a request for $2 million in ESF (economic support funds) for demobilization in Rwanda. Under Secretary of State for Political Affairs Peter Tarnoff writes: "Part of the reason [for the disapproval] seems to be that we only have a limited amount of ESF and there is a general feeling that we've already spent a lot in Rwanda and that the Europeans and others should be doing more." US Ambassador to Rwanda David Rawson responds to a State Department request to argue why Rwanda should be provided with economic support funding (ESF), and why supporting the demobilization program is important. Rawson writes: "There is full agreement on both sides of this conflict regarding the necessity of demobilization, the importance of demobilization for the peace process and the utility of demobilization as an instrument in a reconstruction process. This is one thing that will have full support of all political sides in Rwanda." He also discusses the World Bank's stipulations on the size of the armed forces which provides a cap on the total size of 19,000 members, which would leave 30,000 to be demobilized. He also goes on to detail the total cost, which is proposed to be $136 million, and its five main components. Unfortunately, he writes, "no firm donor financing has yet been indentified for the demobilization program." To: US Embassy in Kigali, US Secretary of State, et al. US permanent representative to the UN Madeline Albright relates concern from the UN in New York that the opposite of demobilization is occurring in Rwanda. She writes in a cable to the US Embassy in Rwanda: "The government is actively involved in distributing arms and training its militia; these cover activities are particularly disturbing given the presence of a RPF battalion." She reports that UN Department of Peacekeeping Operations (DPKO) official Hedi Annabi commented that "the militarization and political stalemate must be read against the backdrop of the deteriorating economic and political situation: there are no salaries for civil service employees, the military, and other public employees, which only adds to an increasingly flammable environment (and already has led to demonstrations and riots)." The US Embassy in Rwanda writes back to the Secretary of State about concerns over the transition to peace, specifically tensions around the demobilization process. Ambassador Rawson writes that "at the enlisted level, many equate the multiparty system and the transition government with their imminent demobilization since most of the demobilized soldiers come from the enlisted ranks. Their biggest concerns are getting adequate training and compensation once they leave the military." He reports on a conference about civil-military relations held with RPF and Rwandan government forces. He warns that low-level officers and enlisted troops might stage a mutiny out of fear that integration and demobilization will leave them without a source of income. State Department Chronology of events in Rwanda; Uvin, Peter,Aiding Violence: the Development Enterprise in Rwanda. Kumarian Press, 1998, Table 4.1; and Melvern, Linda, Conspiracy to Murder: The Rwandan Genocide. New York: Verso, 2004. The United Nations Rwanda Report, cited in Nancy Soderberg's book, The Superpower Myth, found that "the United Nations mission was predicated on the success of the peace process…The overriding failure to create a force with the capacity, resources and mandate to deal with the growing violence and eventual genocide in Rwanda had roots in the early planning of the mission." Soderberg, Nancy. The Superpower Myth: The Use and Misuse of American Might, New York: Wiley, 2005, Pg. 287.